The Powernail 445 LS Pneumatic Nailer is the industry standard and recommended for installing 3/4" and 5/8" hardwood flooring. Uses 16 Gage cleat nails for superior holding power. Made in the USA and built to last a lifetime. 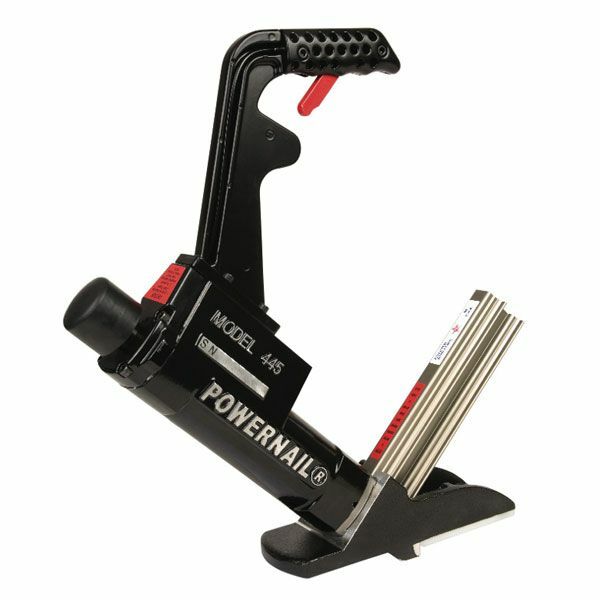 The Powernail 445 mallet activated pneumatic nailer brings Powernail quality to a pneumatic nailer. For those looking for the ease of use of a pneumatic tool, the Model 445 - designed for use with 16 gage 1-1/2", 1-3/4" and 2" Powercleat nails- provides several distinct advantages. The Model 445 can nail 1/2", 3/4", and 33/32" tongue and groove hardwood flooring through the use of easy-to-change adapter plates. Simply snug the boards together with the mallet, tap the plunger on top of the nailer with the mallet and let the Powernailer 445 drive the nail at the correct 45-degree angle and set the nail. Features a safety trigger & interlocking safety mechanism to prevent discharging when not in the nailing position or if the nailer is dropped on the plunger. This durable nail gun is made in the USA and built tough to withstand daily use. Includes a White 3mi Mallet, lube oil, 2 Allen wrenches, extra driving blade, 3/4" & 5/8" adapter pads and 2 shims.